Transform your child's room into a skateboarder's haven and create an instant writing surface at the same time with this amazing chalkboard skateboarders giant wall decal set. Decorative and functional, these creative repositionable RoomMates chalkboard skateboarders mini mural pieces can be written on with chalk (included) and are a quick and easy way to change the look of a room. Our Skateboarders chalkboard peel and stick giant wall decals (also known as peel and stick murals) are repositionable, removable, re-usable, and washable... the perfect combination for decorating the bedrooms and playrooms of kids. This RoomMates Skateboarders chalkboard repositionable giant wall decals set offers decorating ease with no damage or residue to the surface. 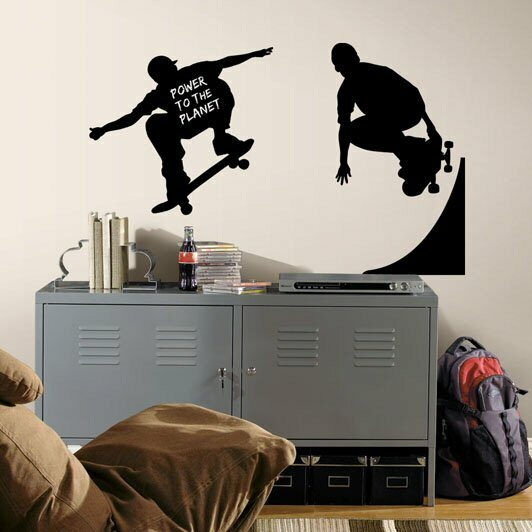 Create an awesome extreme sports theme right on your child's walls with this fun Skateboarder Break Out giant wall decal. Our Extreme Sports wall decals are a fun way to let your kids express their passion for skateboarding and BMX biking.